The first Airbus Flying Challenge workshop of 2018/19 was a great success! Year 9 students from Bristol Metropolitan Academy really enjoyed their first visit to Airbus on the 19th September. Students were introduced to the year-long programme and given an insight into what they can expect over the next 10 months. 20 lucky students from BMA made it through the application and interview process to gain a place on the third Flying Challenge held at Airbus Filton. Sally Melvin, Ablaze’s CEO, manages the programme and she kicked off the workshop. 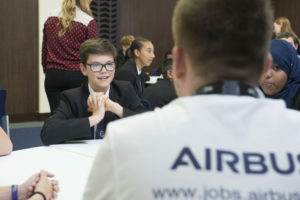 Students were introduced to their Airbus mentors, a group of employees and undergraduate apprentices who will be working with and supporting them throughout the programme. Chris Grier, Head of the Airbus Filton site, gave students a talk about what Airbus does – who knew that Airbus has ferries and specially designed aircraft to ship the wings made at Filton to Toulouse where the aircraft are assembled? 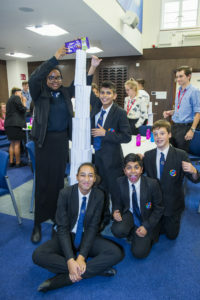 The Flying Challenge focuses on learning through practical activities and hands on experience, so to start learning about structures and strength the students and their mentors were tasked with building a tower out of paper that could hold a 250g bar of chocolate. Competition was fierce – every group wanted to win. There followed some intense design discussion, lots of focused teamwork and a lot of merriment as each group attempted to go the highest.